Born in Pomona, California on June 24, 1907, Sheets grew up on a ranch where he developed a love of the land and horses. After graduating from Pomona High School, he enrolled at the Chouinard Art School in Los Angeles (1925-29) where he was a pupil of Chamberlin and Hinkle. He further studied with Theodore Modra. After traveling and painting in Europe, he taught at Chouinard from 1929-34 and in 1948. During the 1920s and 1930s he came into national focus with his regionalist scenes similar to those of Thomas Hart Benton. He was an art professor and director at Scripps College from 1932-55 and then spent six years as director of the Otis Art Institute. In 1960, Sheets moved north to the Mendocino coast where he built his dream home “Barking Rocks” in Gualala. He lived there until his death on March 31, 1989. His works are mostly landscapes inspired by California and his world travels. As an architectural designer and muralist, he produced over 100 murals and mosaics and designed a like number of buildings including the Home Savings & Loan buildings throughout California. 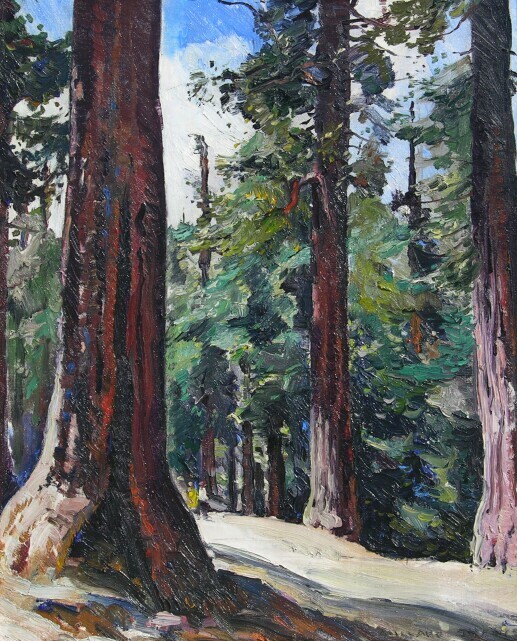 California Art Club; American Watercolor Society; Bohemian Club; National Academy. Los Angeles County Fair, 1918, 1928 (1st prizes); California Watercolor Society, 1926-55; Arizona State Fair, 1928 (1st prize); Paris Salon, 1929; Hatfield Gallery (LA), 1929 (1st solo); Los Angeles County Museum of Art, 1930; Oakland Art Gallery, 1932; Century of Progress Exposition (Chicago), 1933; Corcoran Gallery of Art, 1937; Whitney Museum (New York City), 1939; New York World’s Fair, 1939; Golden Gate International Exhibition, 1939; Pasadena Art Institute, 1950 (solo); Metropolitan Museum of Art, 1966.